With the ever-increasing pace of our lives and the multiple demands we put on our minds and bodies, stress is very much a part of daily routine for most people. It is no exaggeration to say that everyone experiences stress. 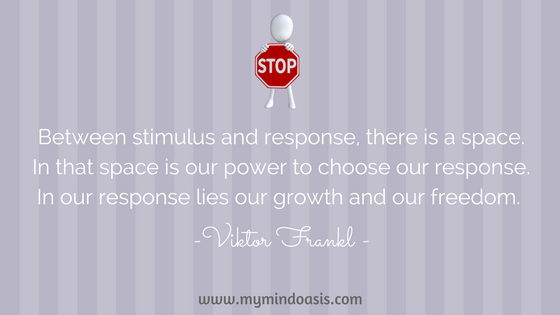 The stressors in our lives vary, but each of us has been through this uncomfortable state. Whether it is related to an upcoming interview, your child’s health, exams, losing a job, an argument with your partner, unpaid bills or a pending deadline – we are all familiar with stress. Are you familiar with the impact of ongoing stress though? You probably know that our bodies are designed to respond to danger through fight-or-flight response. This is accompanied by physiological changes (e.g. increased heart rate, sweating, muscle-tightening) that allow the body to conserve resources and respond quickly. If slowing down seems like a big mistake, think about this: with your mind racing with thoughts about multiple tasks, your focus is divided and as a result, diluted. Your efforts to finish as soon as possible are accompanied by gnawing anxiety, fear of failing, tense muscles and a racing heart. In such a state, you are more likely to miss out on finer details, making mistakes that will cost you more time and energy! Managing stress and learning to cope with it is not only essential for your overall health and well-being but also saves you a lot of time. One of the simplest relaxation techniques is diaphragmatic breathing, also known as deep breathing or abdominal breathing. Our autonomous nervous system (responsible for involuntary bodily functions like breathing and digestion) has two main divisions – sympathetic and parasympathetic. The former, when activated, puts our bodies on ‘high alert’, preparing for danger through various physiological changes (e.g. increased heart rate, muscle tension etc.). The parasympathetic division, on the other hand, helps to bring the body back to normal level of functioning when the threat has subsided. You could imagine it as the ‘brake pedal’ for your racing mind. This metaphorical brake can be actively engaged by practising diaphragmatic breathing. You can read more about it here. Find a quiet, comfortable place to begin. First, become aware of your breathing without trying to change the pace. You can choose to sit or lie down, keep your eyes open or closed – find the way that works best for you. As a beginner, it is helpful to place one hand on your belly while practising diaphragmatic breathing. Breathe in deeply through your nose. As you inhale fresh air, you can feel your chest rising and your belly expanding. Hold your breath and count to three, then slowly breathe out. You will feel your abdomen ‘deflating’ as you exhale. Try to make the out breath slow and deliberate. You can start by practising this for 5 minutes every day. Gradually try to practice this 2-3 times a day for at least 5-10 minutes. You can also combine this with a variety of mindfulness and visualization exercises. As with any new skill, it will take time for you to grow comfortable with diaphragmatic breathing. It is normal to feel some restlessness initially. If you have any existing breathing or heart conditions, please consult your GP/doctor if you feel any discomfort. This is among my favourite mindfulness-based exercises and I can go on and on about how effective this has proved time and again, in my own life as well as that of my counselling clients! This simple mindfulness-based exercise takes minutes to practice and is excellent for bringing down your stress level. It encourages you to create some breathing space in your daily routine, allowing you to fully come back into the present moment, and respond from a position of choice rather than mechanical habit. The acronym STOP stands for the four steps of this exercise: Stop, Take a Breath, Observe and Proceed. To practice this, just stop whatever you are doing for a minute. It might help to close your eyes, but this is not necessary. Take a deep breath, and focus your attention on your breathing without trying to change it. Next, observe your thoughts, feelings and sensations, paying attention to what’s on your mind, how you are sitting/standing, any areas of tension in your body. With this awareness, proceed with your work. Giving yourself the opportunity to take a pause and become aware of your internal and external landscape breaks the monotony of habit. As you observe your mind and body, you learn to release tension. I encourage you to try this with an open mind and a sense of curiosity. 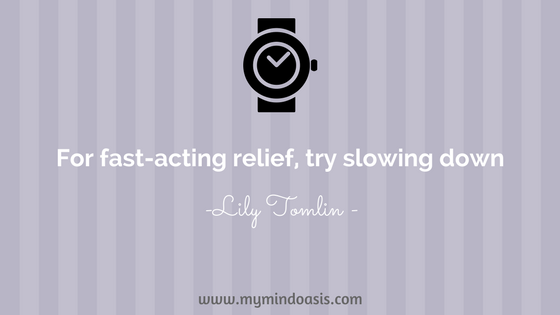 You can practice this when feeling overwhelmed by the tasks at hand. It is also beneficial to inculcate this into your day a number of times. For example, try it before you respond to an email, or while waiting for the bus/train, or while your call is on an unending hold! ;) The possibilities are endless, and all it takes is a couple of minutes! The last exercise I am sharing with you is one of the many grounding techniques. It is a common experience to have your thoughts rushing in all directions when you are stressed. You probably start imagining worst-case scenarios, dreading all the piled up tasks, worrying about managing everything…basically running ahead of yourself when you should be focusing on the present! Grounding exercises assist you to stay in the present moment. This is particularly helpful when you are feeling overwhelmed by stress and finding it difficult to manage your thoughts and feelings. Bringing the focus away from thoughts into your physical experience helps in feeling safe and in-control. four things you can see – it could be people, furniture, spots on a table, a crack on the floor. 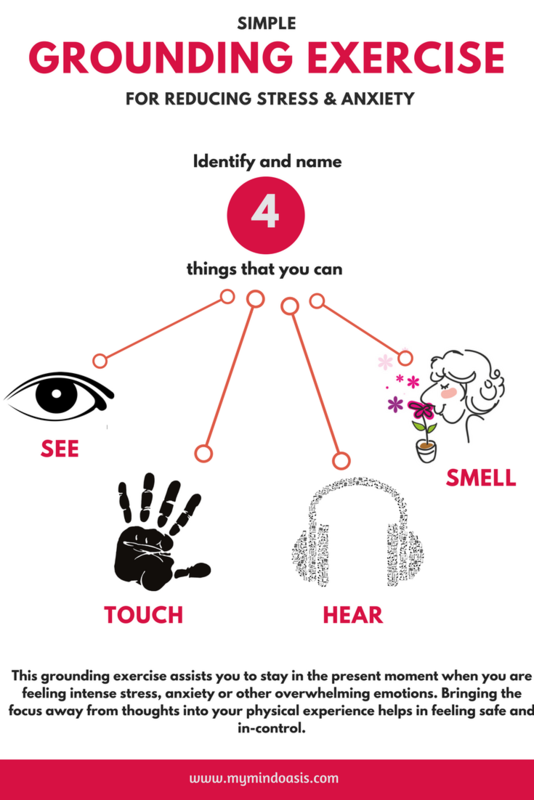 four things you can smell or taste – maybe you can smell coffee? Perfume? Food? Try to follow these steps slowly, and you will notice that your body begins to relax. Temporarily disengaging from your thoughts and focusing attention on external sensations helps to reduce stress. There are no quick fixes to stress. Each of the exercises described above is extremely simple, but to take full advantage of their benefits, you should try to practice them regularly. In addition to these exercises, it is essential to get adequate sleep, balanced diet and physical exercise to reduce stress. There are a variety of other techniques that can be used for stress management and relaxation. The most important thing is to find your fit, and practice consistently! Sometimes, despite trying out a number of things, you may still feel stressed. If that is the case, getting additional support by speaking to a counsellor can help you in identifying areas where change is most pertinent. There may be underlying issues that manifest as stress, and these can be addressed through counselling. Your counsellor can also help you to design a personalized set of tools for reducing stress. What are some of your go-to stress buster techniques? Comment below to share what works for you!